Those of you who were at my talks on 1 April and 14 October have had a preview of some of the aspects explored in the book. It does two things. It is the first book to look at how Belgian commentators have responded to Charlotte Brontë’s depiction of Brussels and Belgian life in Villette and The Professor. Their reactions cover a wide range: hostile, humorous, enthusiastic. At the same time, to provide context for Belgian readers’ reactions, the book fills in the background to the novels by exploring the Brussels world that Charlotte experienced in 1842-43. Her views are contrasted with those of other foreign visitors and of the Belgians themselves. The book offers a new way of reading Villette and The Professor as well as new perspectives on Charlotte Brontë. I also look at ways in which the Brontës’ stay in Brussels has entered the literary mythology of Brussels and fired imaginations. Did you know that in the nineteenth century there were tales of sightings of Charlotte’s ghost in the Belgian capital? Or that all three Brontë sisters lived in a house in Grand Place in 1852 – at least according to some guide books! The book has around 60 illustrations, some in colour. Those who were at my talk earlier this month saw a sample of them. Below are comments by some Brontë scholars who have read the book. I hope you will be able to join me on 7 December in Waterstones for a glass of wine and a signed copy of the book! It’s also an opportunity to support Waterstones, who organise so many such events. John Sutherland was scheduled to visit us for a talk about Brontë puzzles but unfortunately had to cancel due to illness. We hope to enjoy his talk at a later date. Instead, Helen MacEwan entertained us with a talk, Villette as vignettes of 1840s Brussels, introducing us to the Brontës’ Brussels. It contained quotations from writings by Belgian and foreign observers of Brussels, including guide books and travel books by visitors to the city. Among other aspects, it looked at the musical performances and paintings on which Charlotte must have based the descriptions in the novel. The talk was interspersed with readings in which Paul and Ola entertained us with details of Brussels at that period, helping us to visualise the city in which Charlotte and Emily walked. The talk gave a preview of Helen’s next book, Through Belgian Eyes: Charlotte Brontë’s Troubled Brussels Legacy, to be published next month. Here is the book description. 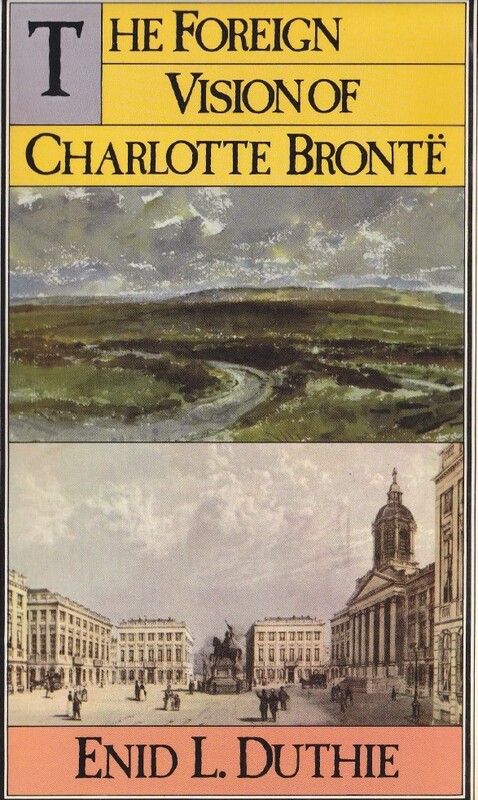 ‘Charlotte Brontë’s years in Belgium (1842-43) had a huge influence both on her life and her work. It was in Brussels that she not only honed her writing skills but fell in love and lived through the experiences that inspired two of her four novels: her first, The Professor, and her last and in many ways most interesting, Villette. Her feelings about Belgium are known - her love for her tutor Heger, her uncomplimentary remarks about Belgians, the powerful effect on her imagination of living abroad. But what about Belgian views of Charlotte Brontë? How have Belgian commentators responded to her portrayal of their capital city and their society? Through Belgian Eyes explores a wide range of responses from across the Channel. It sounds like an interesting read. A highly enjoyable Saturday morning that helped to fill in our picture of the Brontës’ Brussels. 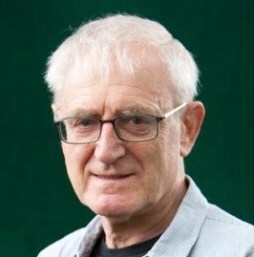 I’m very sorry indeed to have to announce that due to reasons beyond our control John Sutherland will not be able to come to Brussels and speak to us on Saturday 14 October as scheduled. 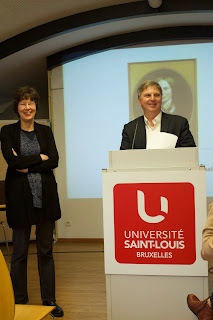 At my talk earlier this year, on 1 April, I spoke about Belgian views of Charlotte Brontë and how Belgian commentators have assessed the view of Belgian life given in Villette and The Professor. This presentation will cover new ground by looking at further aspects of Brussels life reflected in Villette, and compare and contrast Charlotte’s views with those of other observers, both foreign and Belgian. The presentation is a further preview of my new book on this subject. Other Group members will read passages from a variety of writers to build up a picture of life in 1840s Brussels. The event is free of charge and you are all very welcome to come along. If you hadn’t already registered, please register by sending me an email. Directions to the venue below. Time: Doors open for coffee at 10.30 on Saturday 14 October. Presentation starts at 11.00. Metro: Rogier, exit Bd Jardin Botanique. Don't forget to register for our upcoming event on 14 October, 2017, at 11.00. Professor John Sutherland will speak on "An hour’s worth of Brontë puzzles". We look forward to welcoming many of you to hear John Sutherland, Emeritus Professor of Modern English Literature at University College London, He is a specialist in Victorian fiction and a distinguished speaker with a long list of published books to his credit and has a high-profile media presence. Popularly known for his books of ‘puzzles in classic fiction’ (Was Heathcliff a Murderer?, Can Jane Eyre Be Happy?, Who Betrays Elizabeth Bennet?’), he has wide-ranging interests and his books include many companions to and histories of literature. His miscellany of Brontë curiosities The Brontësaurus: An A–Z of Charlotte, Emily and Anne Brontë (and Branwell) was published last year. We’re honoured that he’s coming all this way to talk to us! As usual we are organising a guided walk around Brontë-related places. It starts at 10.00 in the Place Royale area and lasts around two hours. Your guide will be Jones Hayden and there is a charge of €10. To register for either (or both!) of these events just send an e-mail to Helen MacEwan. The second day of our visit was fully focused on Branwell and his Cumbria/Lake District experience. We parked the car on Station Road, and armed with an umbrella, went to look for Broughton House. We did not have a map of the town, so we asked a passer-by for directions and he showed us the way. We did not have to go far and we could not miss it: Broughton House was just down the road in Griffin Street, on the corner, opposite the 17th century Old King’s Head Inn: a big three-storey house in scaffolding. This was the home of the Postlethwaite family when Branwell arrived in Broughton on New Year’s day in 1840. He had been employed by Mr. Robert Postlethwaite as a tutor to the two young sons John and William, aged respectively 12 and 10½. Branwell described his employer in his letter to John Brown (dated 13 March 1840) as “a large landowner, and of a right hearty and generous disposition“, his wife as “a quiet, silent and amiable woman” and the two boys as “fine, spirited lads”. Branwell was certainly determined to make a good impression on his employer. And he seemed to have had quite a lot of freedom in tutoring the boys. He seemed to have had enough leisure time to sketch and write poems (a sketch of Broughton Church and a poem on Black Combe are clear evidence of this). Grasmere is a pretty little village, but a little bit too busy and touristic to our taste. We still had to visit one more house in the area where the Wordsworth family moved to after Dove Cottage, and that is Allan Bank which is a short and steep walk away from the village Centre. When it was being built on a fell side outside Grasmere, Allan Bank was described by William as “a temple of abomination”. The family and some of their literary friends lived here from 1808 till 1811. It was not a house that Wordsworth liked, but it had space, and with an expanding family (two more children were born here) the family needed space. Allan Bank is a National Trust property. 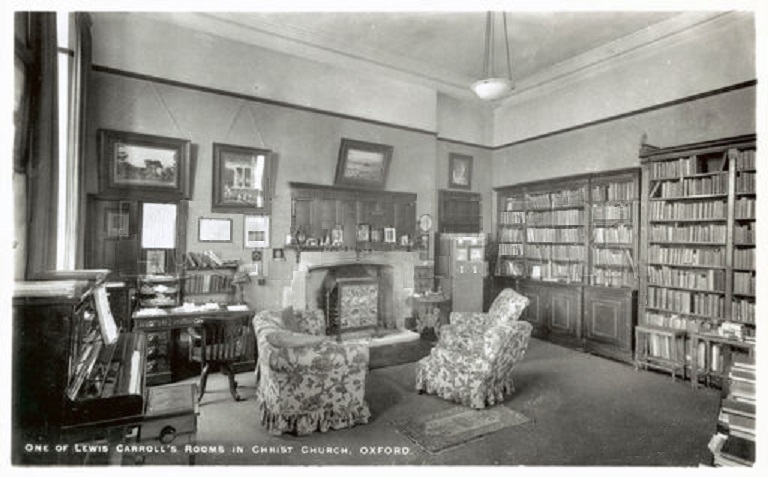 It was purchased by Canon Hardwicke Rawnsley (co-founder of the National Trust) who came to live here in 1917. 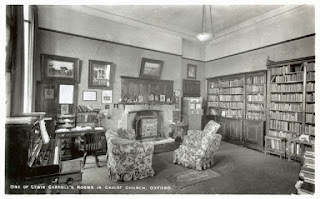 Upon his death in 1920 the property was handed over to the National Trust, on the condition that his wife could continue to live there until her death. The house was seriously damaged by a fire in 2011, but the National Trust restored it and opened it again to the public. However, do not expect a nicely decorated house with all the fine trimmings! 2017 is the bicentenary celebration year of Branwell Brontë’s birth, so my husband and I decided, as we were coming back from our holidays in Ireland, to make a stop in the Lake District and explore the Brontë links with this area, with a particular focus on Branwell. As we were staying in the area for two full days, we decided to also visit the places linked to one of the most famous Lake District poets, William Wordsworth. We found lodgings in Rydal Lodge hotel, a beautiful historic house located near Rydal Water “in the heart of Wordsworth’s English lakes” and situated just opposite the entrance driveway to Rydal Mount, last home of William Wordsworth. It is ideally located for exploring the Lake District, with a bus stop just outside the house connecting the main Lake District destinations. On the first day of our visit to the Lake district the weather turned out very well (bright, sunny and dry) and we decided to explore the immediate area first, so this meant that we were going to visit the houses associated with William Wordsworth. It was evident that our first visit would be Rydal Mount, as it was just a few meters from our lodgings. On our way up to Rydal Mount, we also passed Rydal St Mary’s Church. Wordsworth and his family worshipped here. Wordsworth was also church warden from 1833-1834 and inside the church there is a memorial plaque to him. St Mary’s is built on rocky ground and that is the reason why there is no cemetery. All burials were done at nearby Grasmere , in St. Oswald’s Church, and coffins (amongst others with the remains of the Wordsworth family and Hartley Coleridge) would have been carried to their final burial place via the “Coffin route”. Adjacent to St Mary’s Church is Dora’s Field which was bought by Wordsworth originally to build a house. This plan never materialized and after the death of his daughter Dora in 1847, Wordsworth and his wife Mary and sister Dorothy planted hundreds of daffodils as a memorial to Dora. The Kilkee cliff walk is a scenic loop walk which follows a cliff path along the coastline, passing the truly breathtaking and very varied rugged coastline and returns to Kilkee via the ingoing road. It is certainly worthwhile doing this cliff walk as you come along truly magnificent and stunning sea cliff views around every corner you take. As becomes tradition on our annual holidays to Ireland , Paul and I do “something Brontë”. This year our holidays allowed for a two night stay in the area of Kilkee. We stayed in Hilltop B&B, close to the town of Kilkee. Kilkee (Irish: Cill Chaoi, meaning "Church of Chaoineadh Ita - lamentation for Ita") is a small town located on the South West coast of Ireland, in county Clare, on the Wild Atlantic Way. It was in this town in July 1854, that Charlotte and Arthur stayed for about 10 days on their Irish honeymoon. At that time, Kilkee, situated at the Loop Head peninsula - with its unique climate, natural amenities and bathing areas, beautiful sandy beach and spectacular Atlantic shore and cliff scenery - had become a very popular tourist destination for the Victorians. In July 1854 Kilkee was then little more than a village of about 419 houses and a total population of about 1869 people. those days the authors were researched and compiled with great care. the year of their acquisition, in 1841, to the year of publication in 1952. Books are here listed alphabetically based on the authors' name. Since the beginning of 2004 they have been scanned as images to ease net research. 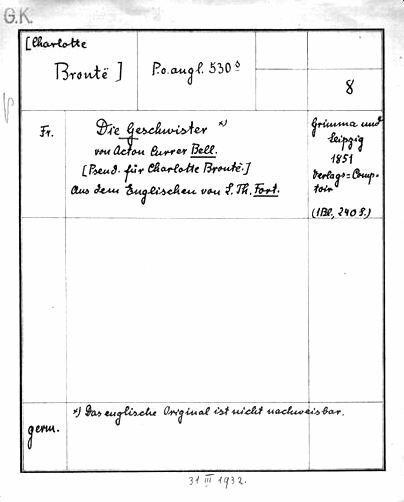 Die Geschwister (= Brother and Sister) / Acton Currer Bell [Pseud. für Charlotte Brontë]. These are the same first lines that in the original title are named “Ernest Vane”. 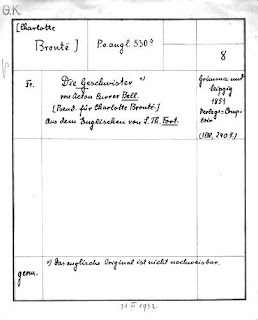 Another false early German Brontë novel, or my discovery of C. Bell’s "Der Sturmvogel - eine Seegeschichte"
An American collector of Charlotte Brontë’s literature asked me some weeks ago to help him with the search for old prints in German language; he needs them for a book he is preparing in the future. 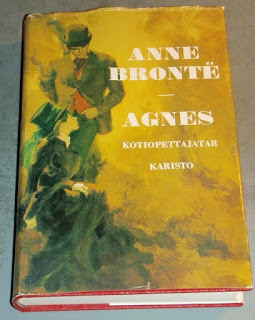 I live in Hannover, Germany and I love books, but it was a long time ago that I read the Brontës. So it was very thrilling to whisk again into their world and I tried to remember what we learned many years ago at school about Acton, Ellis and Currer Bell. 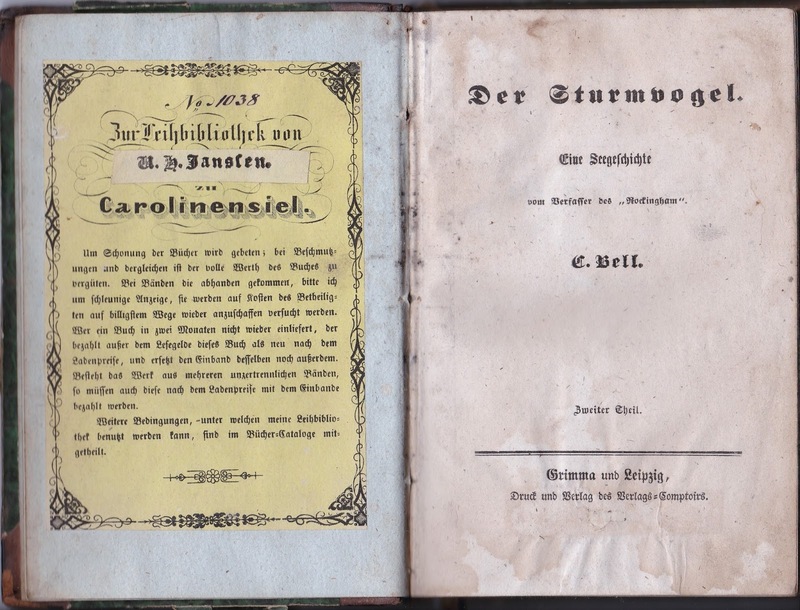 I was surprised to see how many different translations into German happened in the middle of the 19th century and later after 1950 - and how few there were during the two wars. Looking at websites like Booklooker, Justbooks or viaLibri I found out that it is still possible to get rare books from private booksellers if you patiently try different spellings of names and titles. That it states “Vom Verfasser des Rockingham” (by the author of -) makes it implicitly an Acton Currer Bell book, it appeared from an article on this blog about this author. 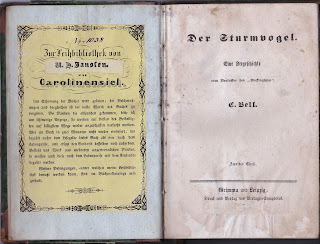 It refers to Rockingham oder Der Jüngere Bruder, published in 1851 in Leipzig. I posted a comment to the article and I quickly got a response from the author - and it was quite easy to find the original novel! It’s all too easy to walk past the bronze plaque on ‘Bozar’ commemorating Charlotte and Emily’s stay in Brussels in 1842-43, as it’s placed rather high on the building. Bozar, as many readers of this blog will know, stands on the site of the Pensionnat Heger (demolished in 1909) where the sisters stayed while in Brussels. The plaque is on Rue Baron Horta/Baron Hortastraat, to the left of the main entrance to Bozar. Added to its lack of visibility, until a couple of weeks ago the Brontë plaque was looking sorry for itself under the grime deposited by air pollution. It now has a brighter look after a spring cleaning. On 2 May it was restored – cleaned, polished and lacquered). The work, which took the best part of a day, was commissioned by the Brontë Society, based in Haworth, Yorkshire, with help from the Brussels Brontë Group. The Society plans to have regular maintenance of the plaque done from now on. The plaque, the only memorial in Brussels to the Brontës, was placed by the Society on 28 September 1979 but the unveiling did not take place till 26 June 1980. According to the report in Brontë Society Transactions, the day of the unveiling ‘dawned bright and sunny but by the time we were assembled for the ceremony stormy conditions prevailed and claps of thunder interrupted the proceedings.’ On 28 June 1980 Le Soir reported that the unveiling had taken place amid a ‘temps de Hurlevent’ – appropriate weather conditions given that Brontë means ‘thunder’ in Greek. At the unveiling ceremony, members of the Brontë Society were joined by Brussels-based dignitaries including the Director of Bozar, two great-grandsons of Constantin Heger (Paul and René Pechère), the British Ambassador and officials of the British Council. There was an exhibition on the Brontës at the British Council to mark the occasion. If you haven’t yet seen the plaque, or would like to see it in its present glory, do go and have a look. 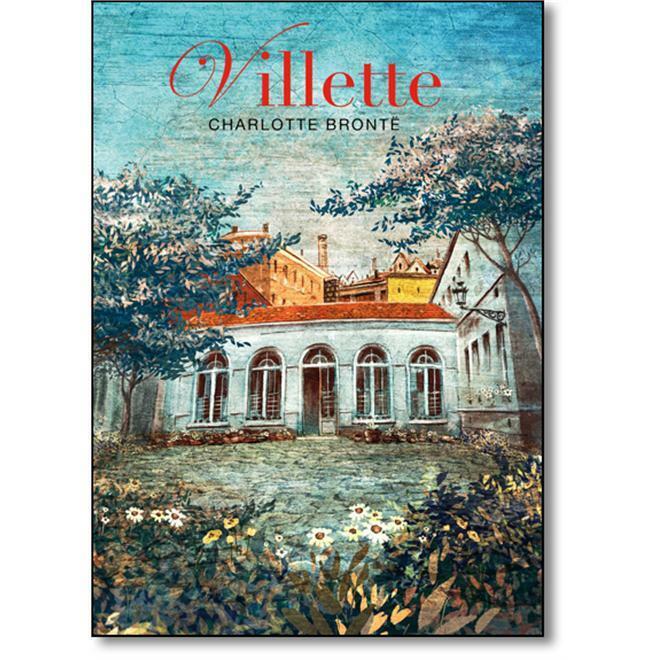 In libraries in the United States a few copies of Charlotte Brontë’s Villette can be found that once belonged to equally renowned authors. The Rosenbach Library in Philadelphia for instance has one that was part of the collection of books of Charles Dodgson (1832-1898), better known as Lewis Carroll, author of Alice’s Adventures in Wonderland & Through the Looking-Glass. He must have loved Villette. He had two copies of the novel! When Charles was eleven years old his family moved from Cheshire to Yorkshire, where his father, a vicar too, got a new and better position. They lived in Croft-on-Tees, near Darlington, but it also brought them sometimes to the Cathedral of Ripon, not that far from Haworth. At home he, like the Brontës, wrote domestic magazines. In 1846 he went to Rugby School, where he spent three unhappy years, and then he went to Oxford. For the rest of his life Dodgson would live there at Christ Church College. 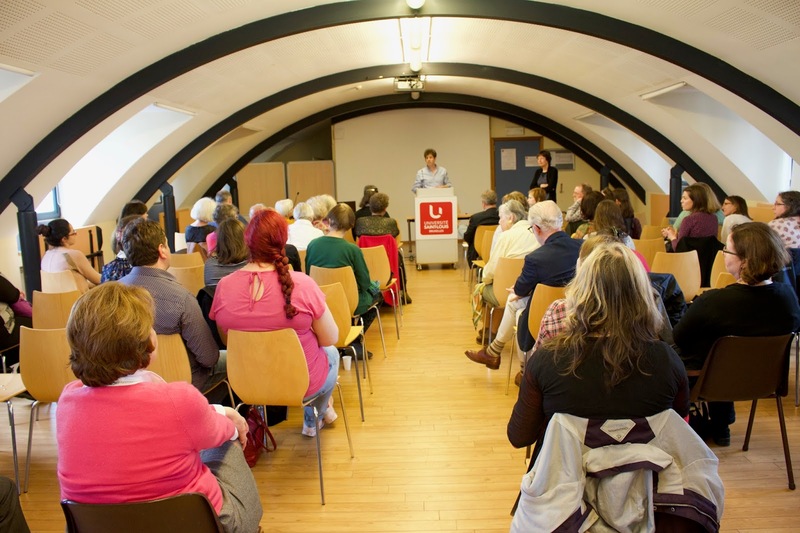 The first speaker at the Brussels Bronte Group's latest Saturday talks can more usually be found introducing lectures than giving them herself. But Helen MacEwan, founder of the group and a familiar face to all its members, on the 1st of April this year took the podium herself. In 2014 Helen’s book ‘The Brontës in Brussels’ was published, a guide to Charlotte and Emily Brontë’s time at the Pensionnat Heger. The subject of her talk was ‘Charlotte Brontë seen by the Belgians: Some views from ‘Labassecour’.' Charlotte was famously unimpressed with much that she found in Brussels in 1842 and 1843, at the same time as being in love with the beauty of the 19th century town - and very probably with one of its citizens, the school teacher Constantin Heger. 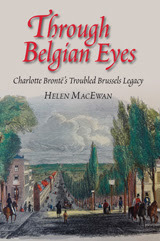 Helen sought to correct the idea that Charlotte's opinion of Brussels had been overwhelmingly negative, and to report some reflections from the other side: impressions the Yorkshire writer made on the Belgians. Yes, Helen said, Charlotte had renamed Belgium as Labassecour – the farmyard, or the poultry yard - for her novel. But she was writing at a time when England and Belgium found much to admire in each other, with Belgium seeing the United Kingdom as the cradle of democracy, and the the UK finding the first king of the Belgians, Leopold, an ideal constitutional monarch. Much of this positive feeling is reflected in Charlotte's description of the beauties of Brussels, in her novels and her letters, which were not only filled with damning portraits of slovenly Flemish students. Charlotte's personal and published writings are also full of praise for a wide range of Belgian pleasures, from the fashions seen on the streets and the culture and lights of the city, to the pistolets she seems to have enjoyed eating so much. Some of the first Belgian reviews of Villette were as uncomplimentary as Charlotte's descriptions of her pupils at the Pensionnat Heger, Helen said. 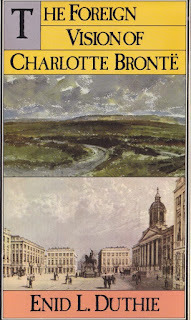 A 1954 review said the book was full of “mockeries and calumnies.” Another critic said it was as misleading for Charlotte to base her portrait of Belgium on experiences at one school as it would be for a writer to use a workhouse as a model for the whole UK. Later critics compared Charlotte to Baudelaire, whose 'Pauvre Belgigue' gives an almost universally negative report of Belgium. The first French translation of Villette available in Belgium, 'La maitresse d'anglais, ou Le pensionnat de Bruxelles' gives Brussels and Brussels place names their real names, dropping Villette and Charlotte’s fictional names. More significantly, many of the more damning passages about Belgium and the Belgians are changed in translation to become much more flattering. Helen, a translator for the European Commission as well as a writer, said she would never be allowed to do such such "creative" work in her day job. 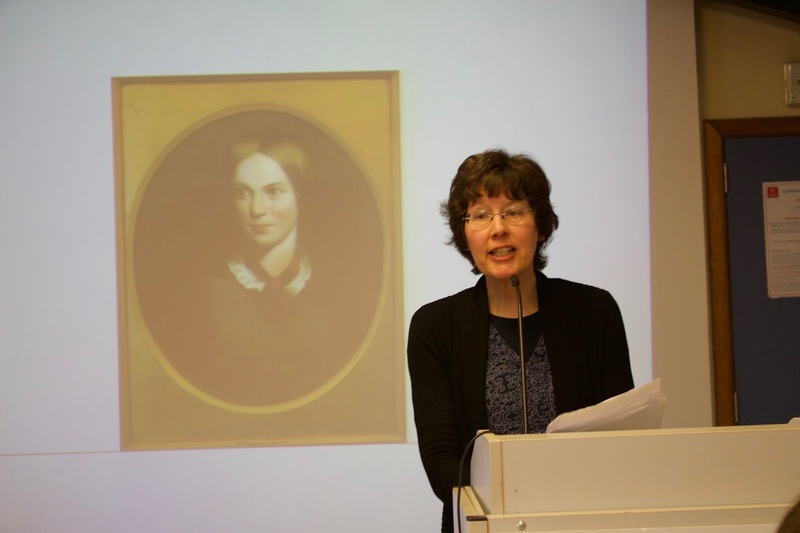 But despite the positive spin given to Charlotte's novel in its French translation, Jane Eyre remained the more popular novel for Bronte fans visiting Brussels in the writer's footsteps, Helen said. 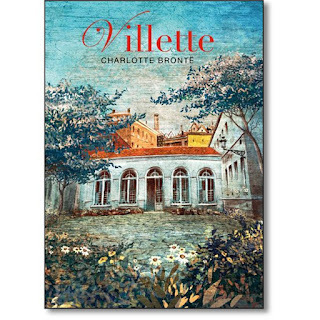 Many members of her audience this month nonetheless will feel a special fondness for Villette, as a portrait of the fascinating but at times frustrating town in which they live - many of them as immigrants, like Charlotte herself. The second speaker in Brussels on 1st April was unfamiliar with Brussels - but has published a guide to the worst towns in Charlotte's home country. Titled ‘Crap Towns: the 50 worst places to live in the UK’, Sam Jordison controversially includes the Brontes’ birthplace of Haworth in his list of places no sensible person should choose to live. 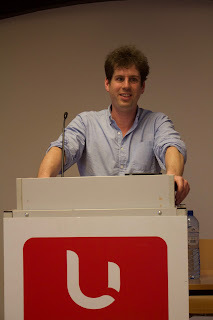 Jordison is a journalist, critic and humorous writer, as well as leader of the Guardian's Reading Group. He has also led anti-Brexit campaigns in the UK - an affiliation that won him a round of applause from most members of the audience at this month's talk. Jordison explained that, while many of the "crap towns" had won their place in his book because they fostered the social problems and alienation "that led to the disaster of Brexit," Haworth's inclusion could be blamed on the Brontes themselves. Haworth "killed the sisters," he said, with its open sewers and lack of hygiene giving citizens an average life expectancy of 25.8 years in the mid-19th century. Had they lived in another town, Jordison said, the sisters might have lived "full lives." Instead, their early deaths were followed by Haworth's conversion into "a theme park," with no real life of its own, only a series of tributes and commemorative sites in honour of its famous former inhabitants. He refereed to a 1977 documentary, "the Bronte Business," which showed how the life had been drained out of the town in favour of a money-making tourist industry. Following Helen's comments on how the Belgians saw Charlotte, Jordison remarked on how the Brontes would have seemed to their own contemporaries in Haworth. Far from being isolated, as is often imagined, the parsonage would have been "the centre of life" in the Victorian hill town. But the Brontes were "cut off" from life in Haworth, he said. "Of course they were eccentric." The sisters would have seemed out of place at any time in history, he said, choosing to keep themselves apart from their neighbours. Even Jane Eyre was in its time an "old fashioned" story, he said, with its "Byronic hero" two decades after Byron's death. The distance we sometimes feel from the Brontes' writing is sometimes even greater today, said Jordison, a self-described "long-standing admirer" of their work. A reader often finds him or herself "making excuses for Jane" when reading Charlotte's most famous novel, he said. Jane operates under "a very different moral code" from 21st century readers - as well as from Rochester and the Rivers in her own time. While doing more research for the China article, the last of the translations series published recently, I found several more previously unknown editions. China brought the total score to 396 editions that have been reported here. 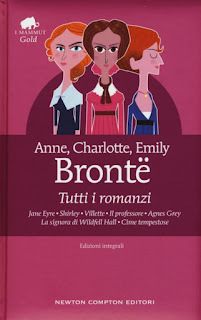 Earlier, recently, a new 2016 Italian edition was found with both novels, and indeed the other Brontë novels too, Tutti I Romanzi. It was published by Newton & Compton (1920 pp.). It has the translation of Marcella Hanau of Villette, and a new translation of The Professor by Angela Ricci. It’s only the second book which has both novels in translation (counting as two translated editions). The first Chinese Villette was published in 1932, in Shanghai, in a translation by Wu Guangjian (1867-1943). In 1930 his Wuthering Heights translation had been published. He also did Jane Eyre, it was published in 1935. Before that, in 1933, this Villette (or: 洛雪小姐遊學記; Luoxue xiao jie you xue ji), got a second edition, of which we know a bit more. It was published by Shanghai Commercial Press, in two volumes (290 and 306 pp.). Worldcat has an edition of ‘192?’, but this is certainly a mistake. The 1933 work refers to the first edition of 1932 (or rather the 21st year of the new Chinese empire timetable). 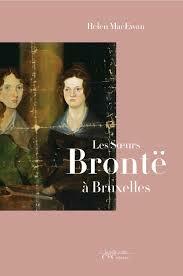 We are happy to read that the Brontës have ended up on a list of top 10 tips what to do in Brussels. There is also a reference to our guided tours. Here is what they say. For more tips what to do and see in Brussels have a look at the Guardian's article. On Sunday 12 March Helen will be signing her book Les Soeurs Brontë à Bruxelles, published by CFC-Éditions. It takes place at the bookfair in Tours et Taxi. You will find her at ‘Espace Livres et Création’, stand no. 230 from 16.00 to 17.00. Let any francophone friends know who might be interested, and if you’re at the fair that afternoon, do go and say hello to Helen! There have been six editions of Villette and The Professor in Japanese, three of each. They were all published in a ‘complete works of the Brontës’ series. The first Villette was published in 1952, by David-sha which also published the first The Professor in 1954. Both were translations done by Jiro Sagara. In 1951 he also did Shirley. The Villette consisted of three volumes, of 232, 278 and 208 pages. Its Japanese subtitle, apart from a Villette transcription, was ‘A Note of a Solitary Soul.’ The Professor had 199 pages. House (with Brontë connection) for sale ! Some of you may remember that two years ago (in 2015) I reported on our detective work during our annual holidays in Ireland, more in particular regarding a Brontë-related house, i.e. Kill House near Clifden, in the Connemara, Co. Galway, Ireland. This is the house where Arthur Bell Nicholls’ cousin, Harriette Bell, lived with her husband, John Evans Adamson, and their children. Harriette was the cousin Arthur proposed to in 1851 and who declined his proposal. In 2015, we found the house while driving around in the Connemara with only vague information on its exact location. As the house was in private ownership, we could not view the inside. We only saw the house from the gate (as shown below). 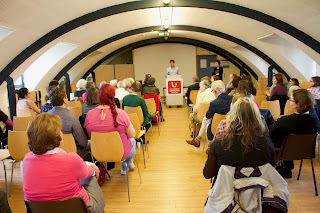 Brussels Brontë Group, talks on "Jane Eyre" and "Wuthering Heights"
Jane Eyre and Wuthering Heights were the subjects of a day of talks by members of the Brussels Brontë Group on 11 February. 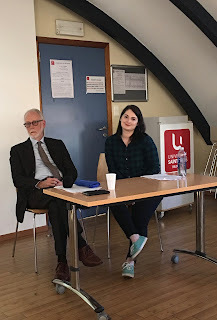 It was a tradi-tionally rainy Saturday in February, and members of the Brussels Brontё Group sought refuge in the rich world of complicated women and windswept landscapes to hear two more fascinating talks from the group members. When at the Pensionnat Heger in Brussels, Charlotte and Emily Brontë wrote quite a lot of essays, or devoirs, at the instruction of Monsieur Heger, in French. These compositions are not only an important part of the legacy of their time in Brussels, they are also “a crucial link between the juvenilia and the novels,” as Sue Lonoff put it in her The Belgian Essays, published in 1996 by Yale. For the first time the texts of all the known manuscripts were published, also in English translations. 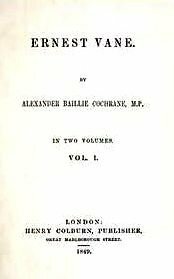 Previously, some could be found in Elizabeth Gaskell's Life of Charlotte Brontë; Enid Duthie's The Foreign Vision of Charlotte Brontë, and several articles in the Transactions of the Brontë Society. The first separate publication of devoirs was Fannie Ratchford's and Loraine White Nagel's Emily Brontë. 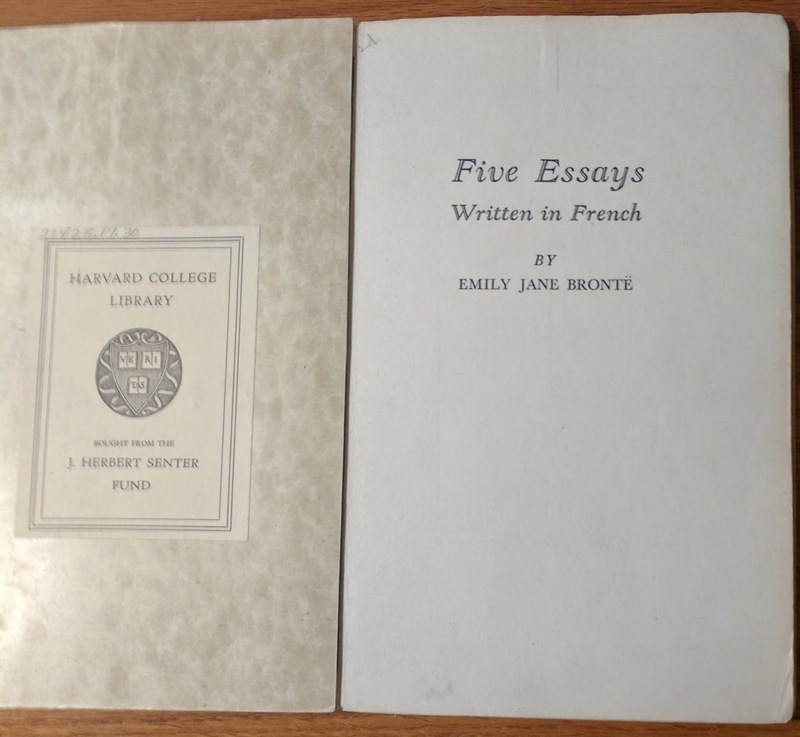 Five Essays Written in French, published in 1948 by the University of Texas Press (with a 1974 reprint by Folcroft from Pennsylvania; 19 pp.). 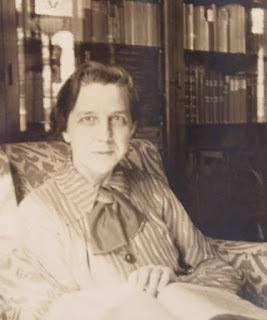 Fannie Ratchford (1887-1974), an important Brontë historian of the mid-20th century, was the Librarian of the Rare Book Collections of the University of Texas in Austin, which has among its collection of Brontë manuscripts one of the devoirs. She was the author of The Brontës Web of Childhood, about the juvenilia, edited Gondal's Queen: A Novel in Verse by Emily Jane Brontë (1955) and contributed to C.W. 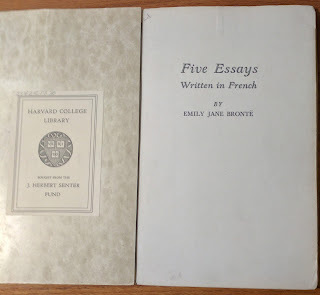 Hatfield’s edition of Emily’s poems (published in 1941) and the Oxford edition of the complete works of the Brontes. In 1960 she published an article in the Transactions with three more essays. 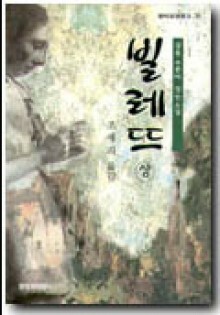 The first Korean Villette was published in 1996, in a translation by Joel Lee. It was published by Ch'angjak kwa Pip'yŏngsa from Seoul. The title gives the sound of Villette, Pillett'ŭ in a transcription. The second translation’s title in transcription is Billette. This work was published in two volumes, of 270 and 218 pages. The covers were identical (apart from nrs. 1 and 2). 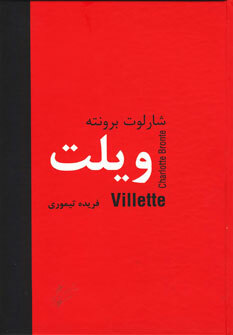 The first Villette translated in Persian (or Farsi; as far as I could gather) was published in 1992 by Insight (474 pp.). The translation was done by Farida Timurid. She also translated Shirley. The second edition was published in 1993. The covers couldn’t be found unfortunately. The third, fourth and fifth editions were published in 2011, 2012 (probably) and 2013 respectively, by Secretary Press (486 pp.). They have the same cover. Only the year of the fourth has been given, 1390, which corresponds with March 2011 to March 2012. The third edition is from January 2011, the fifth from March 2013, so it seems fair to assume the fourth will be from about halfway between. 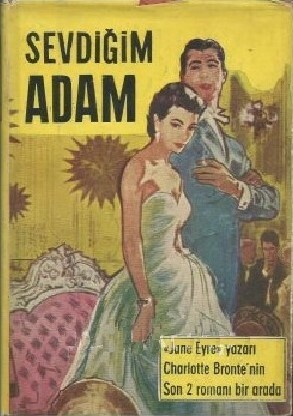 Turkey is unique in having, albeit abridged, both Villette and The Professor in one book, published in 1958 (410 pp.). There were actually two editions of this work, published by Türkiye Yayınevi from Istanbul. This translation was done by Sayhan Bilbasar (1915-1999). It is interesting that the jacket covers only give the The Professor title, Sevdiğim Adam, which translates as Favorite man. 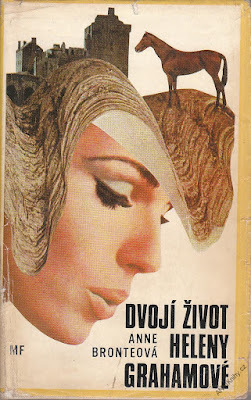 The book covers also give the Villette title, Istirap Yillary, or A Year of Suffering. One edition has a green cover, the other a reddish one. It’s not known which was published first. Anne Brontë was born on 17 January 1820. To commemorate her birthday Eric has collected a few covers of her books. In the last few months more translated editions of Villette and The Professor have been published. And recently two more Villettes were announced to be published in a few months time. These new acquisitions will be presented here, as well as an update on the statistical figures, showing what a successful year 2016 has been. It is for instance the best ever year for The Professor, with 12 editions so far. A few months ago, at about the time the Brazil article was published, a second Brazilian 2016 Villette was published by Marin Claret from São Paulo. 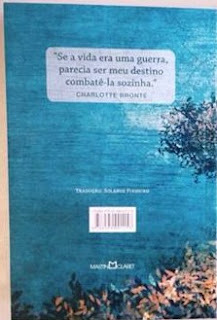 It was translated by Solange Pinheiro (856 pp.). She has also translated Wuthering Heights.